LETTER | I refer to the excuses given by one of Malaysia’s most senior lawyers when he was recently detained by the MACC. So many inconsistencies were noted so I thought I’ll help by listing a few questions that we ought to ask here. Earlier, he said the payments were in respect of unbilled fees since 2004. As a lawyer, he will know that debts above six years, in general, are unclaimable. So which person would be willing to make payments on bills from 2004? I don’t know of any legal firm that will ordinarily hold back billings or collections for 18 years. My lawyers usually ask me to pay upfront before the trial even starts. I didn’t know he was so accommodating; Tan Sri, I will want to hire you under the same deferred payment terms. I will cut you a cheque after a few years, okay? I must commend him, though. He was such a good friend that he wished to help his friend buy a house costing almost RM10 million. And he was prepared to borrow the amount. Very honourable indeed. It would be good if he could please provide further information on this RM9.5 million house that he obviously had committed to (otherwise there was no need to loan the amount from Najib Abdul Razak). Being publicly highlighted, I think his good friend should also come out to support him. Oh, I didn’t know that Najib was also a moneylender? It must be the hard-earned monies that he had saved up on his monthly salaries/ allowances. So after saving up for about 15 years, Najib is able to embark on a new business. This is almost a similar savings culture like his wife, saving up since she was a baby to buy the RM21 million ringgit ring … oh, sorry, it appears that now the ring was actually for her foreign sister-in-law and she just viewed it in KL. Very confusing these stories as they keep changing. Wait a minute, Najib is not allowed to charge interest under the law if he is not a licensed moneylender, so he is forgoing his 1.5% pa interest from his bank to “lend” to you, his legal counsel. Now, isn’t there a legal good governance code (Bar Council?) of sorts that states a lawyer cannot borrow from his client when a case is ongoing and vice-versa? Actually, the explanations he gave are really confusing. 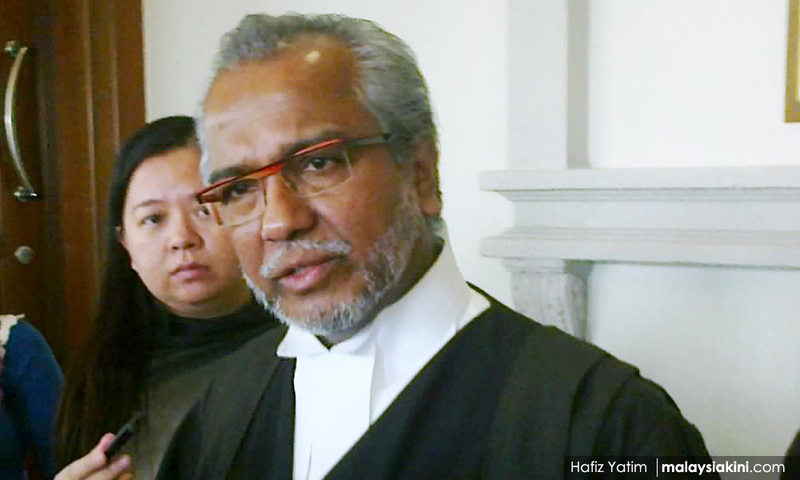 He said he didn’t receive money from Najib for the Anwar Ibrahim prosecution. then he said the money was for old Umno bills, then it was a loan from Najib to buy a house for his friend. He should have just asked Najib for an outright donation as Najib is used to getting large ones as he himself has admitted. Under the Anti-Money Laundering Act (Amla), a business person is legally obliged to ask the payer about the source of his funds and take necessary actions to validate the representation given by the payer. He, as one of the most senior lawyers in the country, surely cannot say”I didn’t have to know the source of his funds”. He ought to have asked by law. Why did he not? He said the reason he hadn’t paid income tax was because he hadn’t “rationalised” his billings. Now, besides being confusing, what does that “rationalisation” exactly mean? If those are payments for fees since the early 1990s, then they are income no matter how he “rationalises”. Effectively, by Malaysian tax laws, you have not paid income tax on the monies you received in 2013 and 2014. And by the way, please don’t take us for fools – income tax is payable on a “received” basis and not on an accrual basis in Malaysia. If you received monies in 2013, you pay the tax on that amount in 2014 – not “rationalised” till 2018. I am willing to appear as an expert tax accountant for free – but if the attorney general wants to pay me, say RM 9.5 million in 2018 for this service, I will pay the tax on it immediately (although I can pay before April 30, 2019) instead of “rationalising” till some five years later. I suppose if he had not been queried on this by the reporters – until when will he be “rationalising” his taxes? As a senior lawyer who ought to know some basic tax laws, it’s really unacceptable to give such excuses. I’d also like to see our Inland Revenue Board head answer this “rationalisation” excuse. He has a diplomatic passport because he is an ambassador-at-large for human rights. I wonder if the members of Suhakam also have similar passports? In fact, if I recall, there are other members of Malaysian-based NGOs who travel more frequently on their jobs and still use normal passports. I am impressed that he holds one till now. Very handy for easy immigration clearance indeed. I have more questions but I think I will allow the relevant authorities to do their job. But like I said earlier, I have many assignments for you, Tan Sri, that I will gladly pay on a deferred basis.